While we just heard first news about the mysterious Moto G, which is apparently the low budget version of the Moto X smartphone, an alleged promo card of the device has leaked, revealing all the specs of the device. According to the leaked promo card of the Moto G the device would feature a 4.5 inch display with a very high density of 1280 x 720 pixels resolution. The handset would be powered by a 1.2 GHz quad core Snapdragon S4 Pro processor along with 1 GB of RAM and 8 GB of internal storage. However, the smartphone would come pre-installed with the Android v4.3. 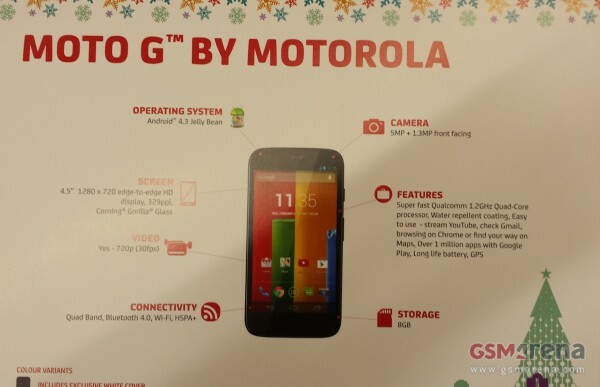 The Moto G would be equipped with a 5 MP rear facing camera and a front facing 1.2 MP camera. The device has a LG made 1950 mAh battery. Interestingly, the device is expected to be priced at $215 off-contract and is rumoured to be given free on contract.